All the “normal” songs from Todd’s back catalog rolled into an evening’s worth of entertainment. Kronomyth 9.0: Live in action. The label likely had Frampton Comes Alive in mind when they commissioned Todd to create a double live album. What they got instead was something more like Zappa In New York. Fans had long mused that, if Todd could only distill his songwriting genius and filter out the oddness, he would be a star. Back To The Bars, however, makes it plain that even at his most “commercial,” Todd was still too mercurial an artist to have mass appeal. What labels had in mind with the double live album, beyond the imagined riches of multiplatinum sales, was the appeal that a collection of re-recorded greatest hits might have. In that respect, Back To The Bars is a success. You won’t find a better assortment of Todd’s bits anywhere else. AWATS, Todd and Initiation tested even the patience of fans. By editing out the oddness, Back To The Bars feels like skipping straight to dessert without eating your vegetables. The studio versions are cleaner, true, but the live versions of “Hello It’s Me,” “Couldn’t I Just Tell You” and “Love In Action” are nearly as good and I actually prefer these live versions of “The Range War” and “Don’t You Ever Learn?” to the originals. Ultimately, Something/Anything? remains the logical place to start in Todd Rundgren’s catalog. After that, you might want to hedge your bets with Hermit of Mink Hollow or even Faithful, but you’d be getting a much broader picture of the artist with Back To The Bars. 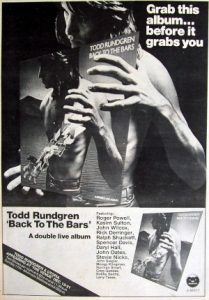 At first, I’ll admit, I didn’t have much use for a live double album from Rundgren. Looking back today, it seems like an oasis in a desert of deliberately difficult music. All songs written by Todd Rundgren unless noted. 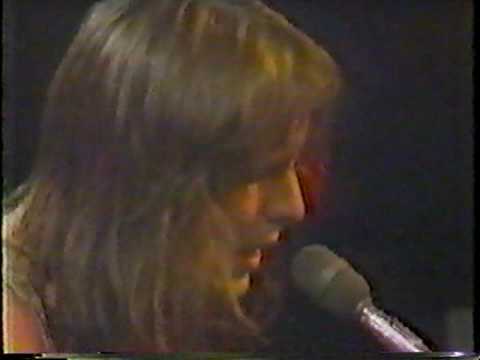 Todd Rundgren (vocals, piano, guitar) with Spencer Davis (harmonica, vocals), Rick Derringer (guitar), Greg Geddes (background vocals, mime), Daryl Hall (vocals), Moogy Klingman (keyboards), Stevie Nicks (vocals), John Oates (vocals), Roger Powell (keyboards, trumpet, vocals), Bobby Sedita (background vocals, mime), Ralph Schuckett (organ), John Siegler (bass, cello), Norman Smart (mime), Kasim Sulton (bass, vocals), Larry Tasse (background vocals, mime), John Wilcox (drums, vocals). Produced by Todd Rundgren; mixed by Todd Rundgren. 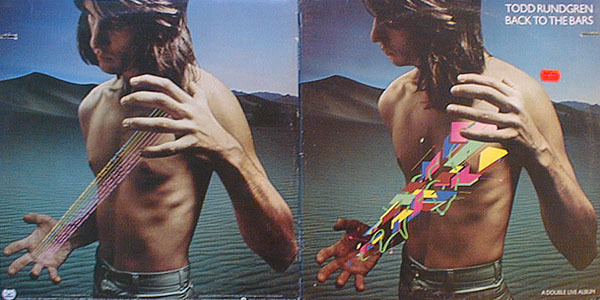 Sleeve design and photos by Hipgnosis. Live photos by Richard Creamer, Chuck Pulin, Kevin & Michael Ricker. Released on 2LP, 2CS and 2-8T in November 1978 in the US, Australia and Canada (Bearsville, 2BRX/J5W/BEA J8A-6986), the UK (Bearsville, K 65511), Germany (Bearsville, BEA 65511) and Japan (Bearsville, P-5561/2W) with gatefold cover and picture innersleeves; reached #75 on the US charts. Re-released on remastered 2CD in 1988 in Japan (Victor, VDP-9025/6). Re-issued on 2LP and 2CD in 1990 in the US (Rhino, RNDA/R2-71109) and on 2CD in 1990 in Japan (Victor, VICP-40017/8). Re-issued on 2CD in 1999 in the UK and the Netherlands (Essential, ESDCD-704). Re-issued on 2CD in Japan (Bearsville, VICP-60265). Re-released on K2 remastered on June 28, 2006 in Japan (Bearsville, VICP-63460/1). Re-issued on remastered 2CD in 2008 in Japan (Victor, VICP-64214/5).